The group has grown from several ad-hoc, small scale studies of the social life of medical science in Africa. For example, a study of Gambian vaccine trials explored tensions between ethical and scientific protocols and everyday scientific work. Research undertaken within a Kenyan collaborative health research project showed how medical research inserts itself into local relations and local ways of negotiating power and wealth. Inquiries among medical colleagues working in Africa showed an omnipresence of rumours about unequal exchange, which could be interpreted as an ethical debate about the wider frames in which medical research is conducted. 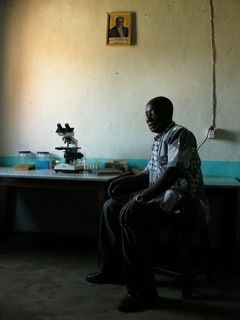 While these and other instructive experiences in the context of medical research projects provided our initial inspiration, the aims of our group – consisting of members in Cambridge and collaborators in the UK, Europe and Africa – are broader, going beyond questions of ‘local’ encounters, research ethics and the ‘researcher-researched’ interface. Our studies of medical research in practice explore the interaction between social, cultural, political, economic and scientific factors shaping scientific medical research in contemporary Africa, with the aim of a better understanding of medical science and of African society – and of both within wider, global, networks. In other words, our aim is to delocalise the study of ‘African modernities’ that has been fashionable in anthropology for a while, by studying global networks of science; and we attempt to resituate the social study of science by moving from the laboratories into the ‘fields’ of medical field research, which combine traits of the laboratory with the features of the localised ‘communities’, whence ethnography once derived. Both movements are intended to bring us beyond the blockage that dichotomies of local-global (or Africa – West), as well as science-public etc. impose on our understanding. 1. To explore ethnographically the social life of African ‘trial communities’ on different levels, from villages to universities, technologies to ethics, laboratories to journalists. 2. To elucidate the recent history of medical research in Africa with an emphasis on the evolution of institutional, political-economic and scientific structures. 3. To examine ties between past and present in medical science in Africa, considering personal and institutional memory and understandings of change. 4. To use anthropological and historical approaches to identify key challenges to ethical and democratic, effective and equitable scientific research in Africa. Our research has been funded by the Wellcome Trust, the Leverhulme Trust, ESRC, the European Science Foundation and the British Academy. We began our work together in 2006 and expect to end our current project frame in 2015.